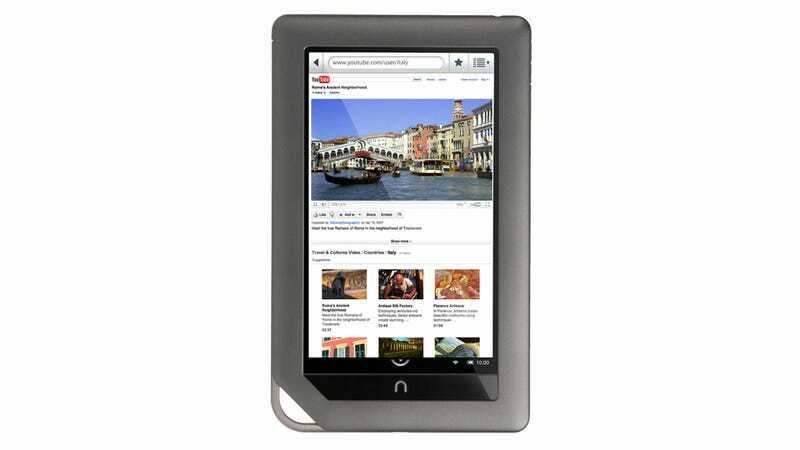 Nook Color Gets Apps: Is It a Real Android Tablet, Real Cheap Now? The update dropping for the Nook Color today is the big one: It tries to take the Nook Color all the way to a full-blown tablet for $250. With the update to Android 2.2, the Nook Color is getting a better browser with Flash support, real email and calendar programs, page-turning animations (a big deal for some people!) and yes, apps. The apps have to be designed specifically for the Nook Color, with Barnes & Noble approving every one of them—the main guidelines B&N's pushing for apps is that they're "suitable" for the Nook Color's reading-centric existence, and that they're designed for the 7-inch screen (avoiding the one of the problems that plagued the Galaxy Tab). So, think reading apps like Pulse and Epicurious (which looked pretty great) and simple games like Angry Birds. They're launching with around 125 apps today.